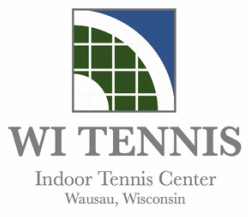 WI TENNIS is a members-only, family orientated indoor tennis center that offers a variety of membership options at an affordable price. Our comprehensive Tennis Program provides a variety of tennis playing, coaching and competing opportunities for tennis players of all ages and abilities. WI TENNIS is conveniently located in down town Wausau, Wisconsin in North Central Wisconsin. Our facility has 4 indoor tennis court, mens and ladies changing rooms, Babolat pro shop, reception area, plenty of accessible parking and 3 full time tennis professionals. Please feel free to browse through our web site, to see what we offer, and should you require further information please visit our contact page. We look forward to seeing you on the courts ! WI TENNIS is open from September to May and the tennis courts will be closed during the summer months June - August.